Use this vanity to bring more traditional style into your bathroom. Made with a special white solid wood base and a white marble counter, this piece will make your bathroom look even nicer. With drawer and single-door cabinet, this vanity set is also great to keep items in. Put a nice twist on your bathroom project with this classic piece from Wyndham Collection. If you want a vanity that is both stylish and useful, this traditional vanity is perfect. Its white marble counter and white solid wood base will look beautiful in your home. Its double-door cabinet and drawers have lots of room to keep all of your bathroom items. Bring a classic look and feel to your bathroom with this beautiful set from Wyndham Collection. For a bit of traditional style in your bathroom, choose this beautiful vanity. The white marble counter and white solid wood base make a beautiful look in your bathroom. Made with a roomy double-door cabinet and drawers, this vanity has lots of room to keep items like toothpaste, towels, and hair brushes. This simple vanity set from Wyndham Collection will fit right into any bathroom decor. For some added traditional style in your bathroom, choose this beautiful vanity. Its beautiful white marble counter and white solid wood base bring a great new look into your bathroom. The simple look of the double-door cabinet and drawers is useful and classic. Redo the style of your bathroom with this classic from Wyndham Collection. Acclaim 24-inch W 1-Drawer 1-Door Freestanding Vanity in White With Marble Top in White Use this vanity to bring more traditional style into your bathroom. Made with a special white solid wood base and a white marble counter, this piece will make your bathroom look even nicer. With drawer and single-door cabinet, this vanity set is also great to keep items in. Put a nice twist on your bathroom project with this classic piece from Wyndham Collection. 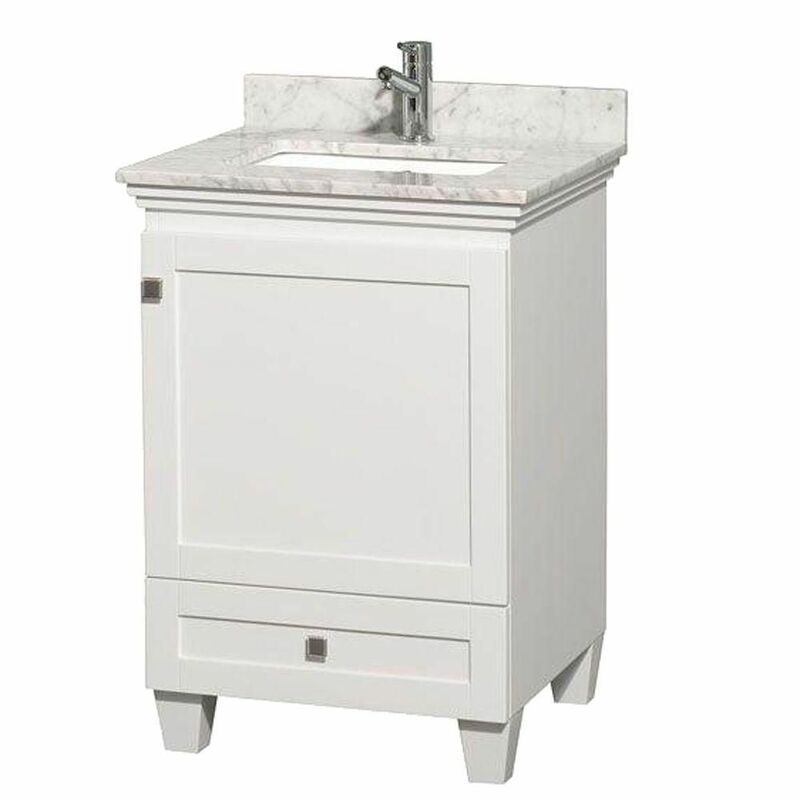 Acclaim 24-inch W 1-Drawer 1-Door Freestanding Vanity in White With Marble Top in White is rated 5.0 out of 5 by 1. Rated 5 out of 5 by Anna from My wonderful son-in-law just installed this gorgeous vanity for us... My wonderful son-in-law just installed this gorgeous vanity for us and we love it! The sink, countertop, and backsplash were already assembled as one piece. I chose this one because it is real wood and you can feel how solid it is. The soft-close hinges and beautiful hardware are a nice plus.